After a busy first week, we've ended up taking a week's hiatus here on TRS. Now let's get back down to it! This isn't the post where I make the case for how great Ms. Mary Margaret is and how urgent it is that you get to know her only album, the unique, loopy gem Miss America. This post is mostly for those who already know, and already have so gotten, though it's also a fine place to begin your acquaintance. And since Miss A. is Miss O's sole full-length release, aficionados will delight to discover this great, full-length concert from London's Dominion Theatre, as broadcast on the BBC. I found this on a torrent with the following credit: "Capture, Transfer & Artwork by JTT" who taped this off BBC radio and shared it. So thank you very VERY much, JTT! However, it's not to be found elsewhere online, so it deserves its spot here on The Rare Stuff; I hope Mr. T doesn't mind. The Miss America album itself is out of print and starting to climb in price (though still affordable used), but it's a bit more widely available online. If there are enough requests, though, I could make it available here as well. Anyway, we've finally broken our string of moody, wordy white British men -- with a quirky white Canadian gal! 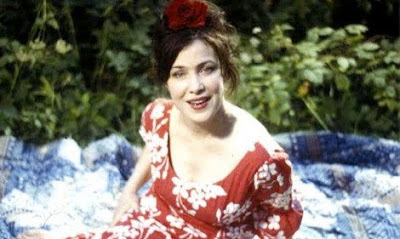 Fun fact I just learned -- Mary Margaret is the sister of SCTV comedienne and actress Catherine O'Hara! So glad you dig it, Peter, and thanks for saying so! thanks very much - she's one of a kind! Dugg!??!!? I just realized -- you're Dugg Simpson!!!! It's great to see you visiting my blog! This is Jeff Rosenberg from KBOO in Portland, we've spoken a couple of times at the Festival. I'm friends with Amanda and working a little bit with her on the Portland fest; I'm compiling a CD of all of Dan Bern's appearances on KBOO as a fundraiser for it. You'll love it, I think it's as good as anything he's ever released. ! I don't know if you'll see this comment here so I will email you too. And thanks for mentioning the Henrys, I think I'll post "Chasing Grace" here soon! a wonderful gift, thank u very much ! do you, by any chance, own the Christmas ep, and if yes would you share it ? Wow. Thanks so much for this. Much appreciated. You are a gentleman and a scholar Sir! Great blog ! Do you happen to have a set list for this one ? BTW, Mary has also done the OST for a movie, the apartment. WOW any friend of Mary Margaret is a friend of mine. Thanks. Thank you very much for this one. Missed this one. ANy chance of reuploading, please? Just thought i'd let you guys know I too recorded this concert off the BBC.However I recorded 12 songs,so what happened to JTT's recording?? ?